The smell of smoke was heavy on the air for miles around on the morning of October 7, 2015. Neighbors awoke to the news that the Shrine of Christ the King, 6401 S. Woodlawn Ave., had suffered a devastating fire – the second in the history of the building. When the hoses were packed up, the walls were still standing, but this pillar of the Woodlawn community faced an uncertain future. Members and neighbors are now fighting for its future. 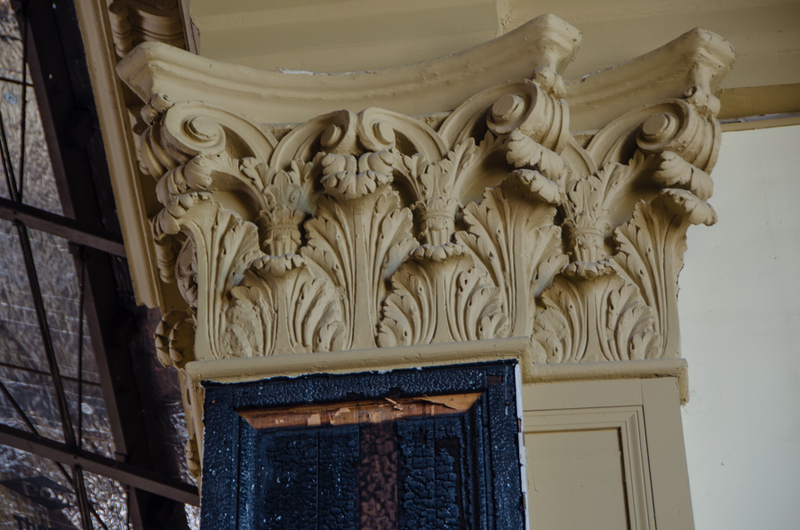 Learn why the building is worth saving, and what you can do to help. 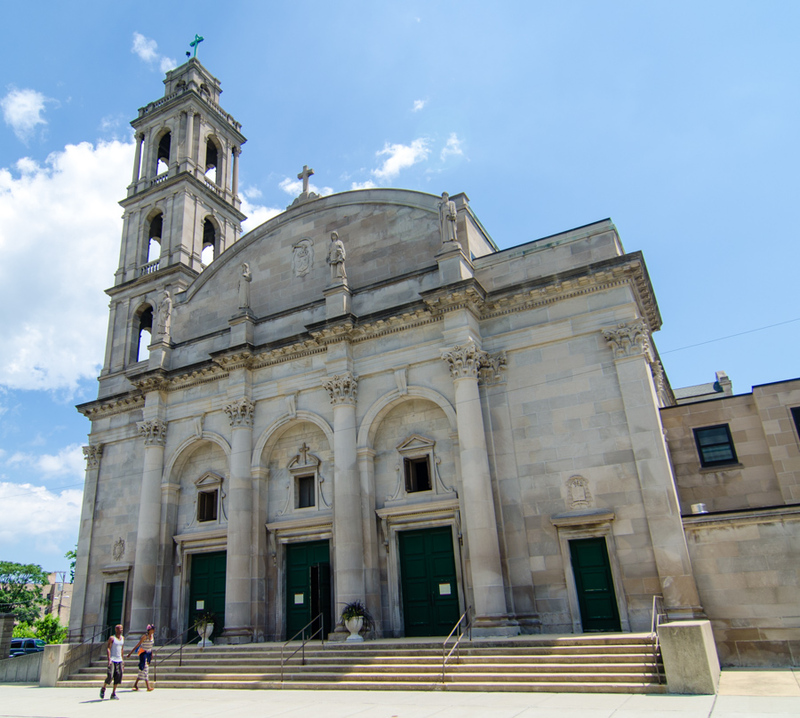 The parish of St. Clara was founded in 1894 to serve a largely German community that had sprung up in Woodlawn amid the boom of the nearby World’s Columbian Exposition. 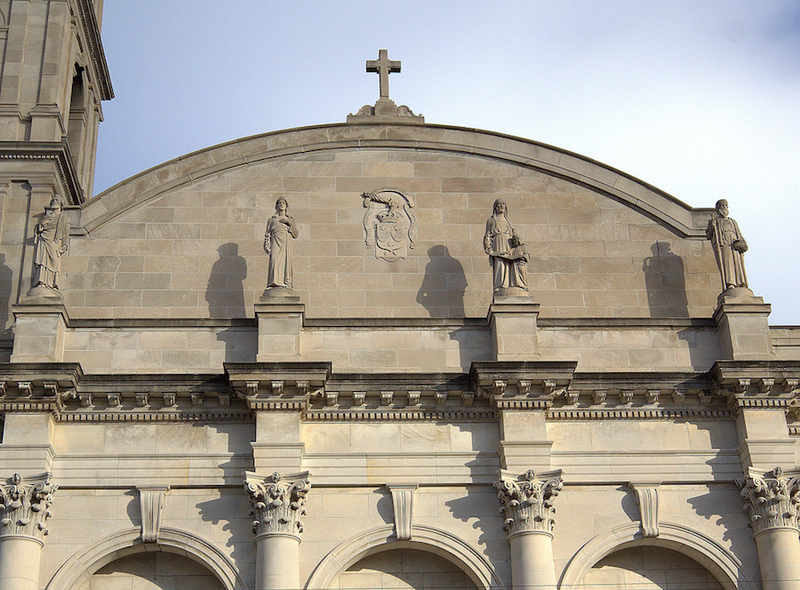 By the 1920s, the neighborhood was more Irish, and the parish was thriving – so much so that Chicago’s foremost ecclesiastical architect, Henry J. Schlacks, was retained to design a new building. Schlacks, the son of German immigrants, studied architecture at MIT and trained under Adler & Sullivan. He cultivated a rich vocabulary of historic architectural styles, particularly Gothic and Renaissance Revival. Some of his notable extant works include St. Paul, St. Henry, St. Adalbert, St. Boniface, St. Mary of the Lake, and St. Ita. Such was his renown that he became the founding director of the Notre Dame School of Architecture. Schlacks, who lived nearby, produced a remarkable church for Woodlawn, costing the equivalent of $7 million today. 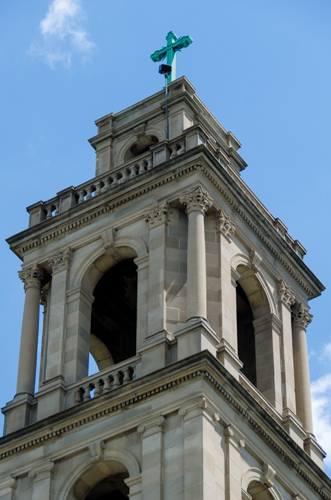 Like St. Mary of the Lake, his design for St. Clara is distinctively Renaissance Revival, with a Baroque façade and an attached campanile with clear Roman heritage (and, at 120′, one of the tallest spires around). 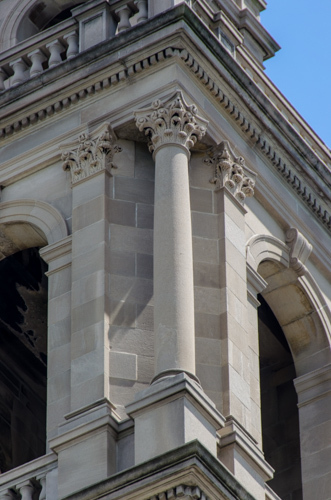 Columns abound, representing all the Classical orders – Doric, Ionic, and Corinthian. The interior was no less ornate, clad nearly entirely in Circassian walnut. 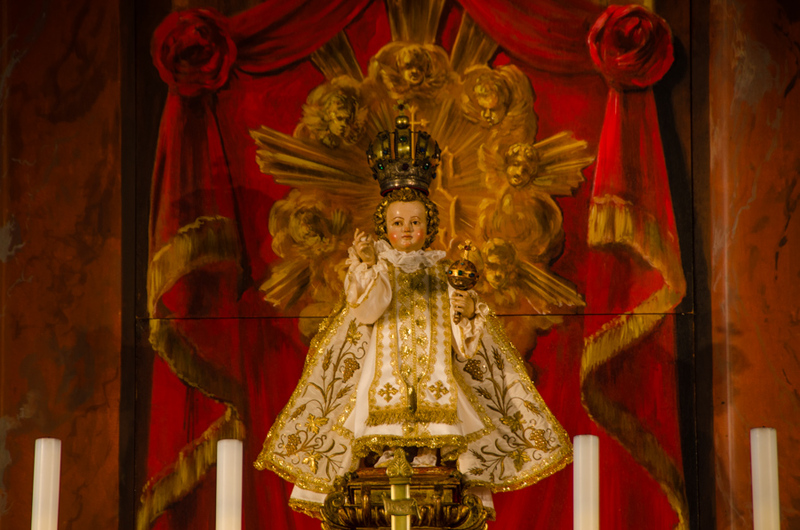 From early on, the parish also hosted a shrine to St. Therese of Lisieux, “the Little Flower”. 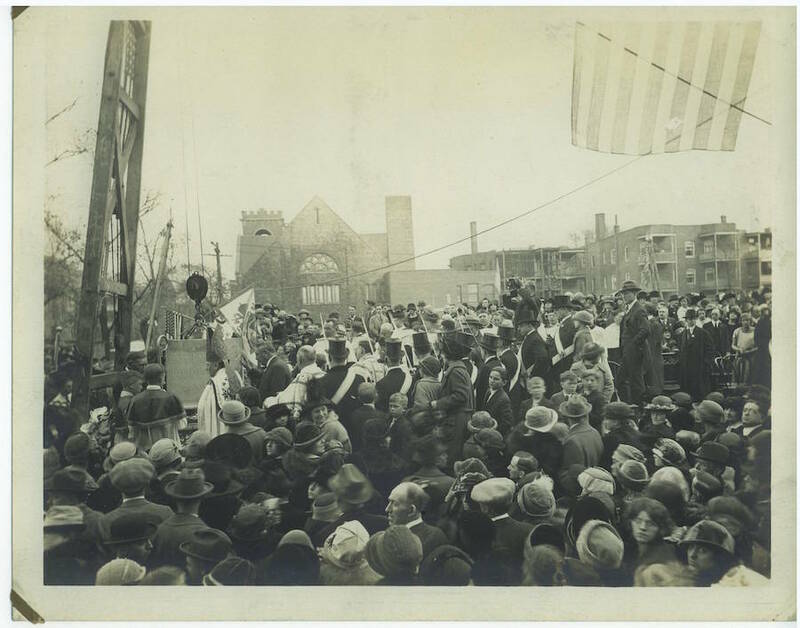 Just over a decade after the dedication of the church, racial change came to Woodlawn, at first slowly, then with all the fury of white flight. The important Supreme Court case Hansberry v. Lee, decided in 1940, began to invalidate racially-restrictive covenants in parts of the neighborhood. 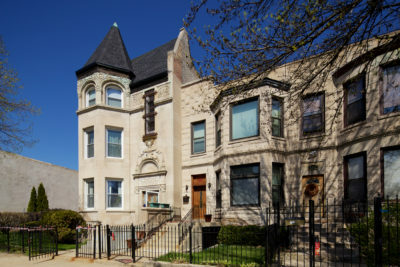 Chicago’s housing market remained nearly frozen until after World War II, but by 1960, Woodlawn was 90% African-American. 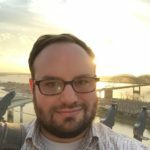 Those churches that didn’t follow their white flocks to the suburbs typically focused on addressing the manifold problems of the volatile and overcrowded neighborhood, working to foster a Biblical vision of social, economic, and racial justice. Neighboring First Presbyterian Church was, for a time in the late 1960s, the site of a controversial training program for members of the Blackstone Rangers. Father Tracy O’Sullivan brought this conviction to the parish in the mid-1960s. 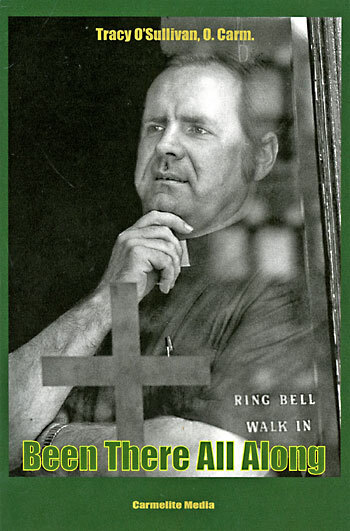 O’Sullivan was involved in efforts to work with the gangs, and agitated for racially-open affordable housing in the community – much to the consternation of some of his parishioners and the largely Catholic Democratic power structure of Chicago. 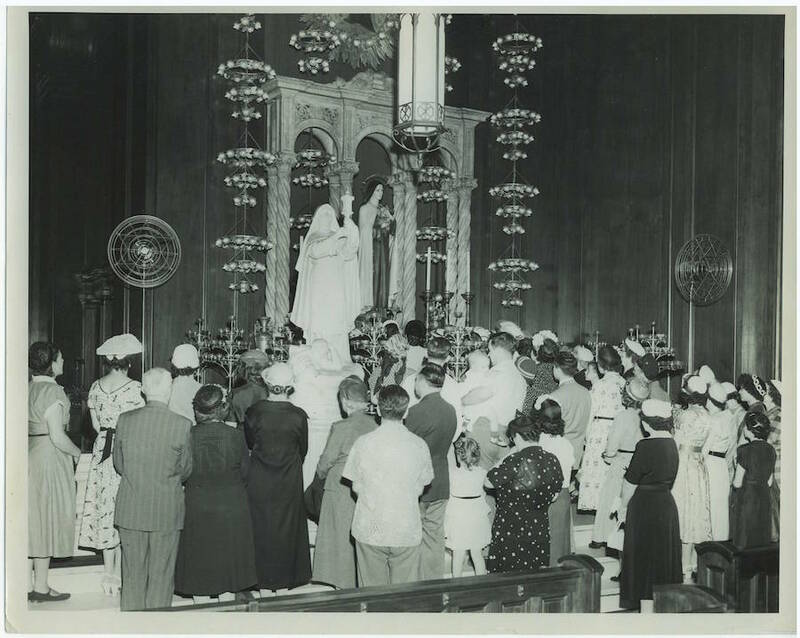 In April 1976, a fire swept the interior of St. Clara – St. Cyril (renamed in 1969 to reflect the absorption of a closing parish). Some have speculated that the fire might have been deliberately set in retaliation for the church’s activism or perceived alignment with the Blackstone Rangers – though if this was the case, First Presbyterian Church next door was more likely the intended target. The original interior was almost completely destroyed. Limited repairs were made, and the parish struggled on for several decades, membership declining with the surrounding neighborhood. 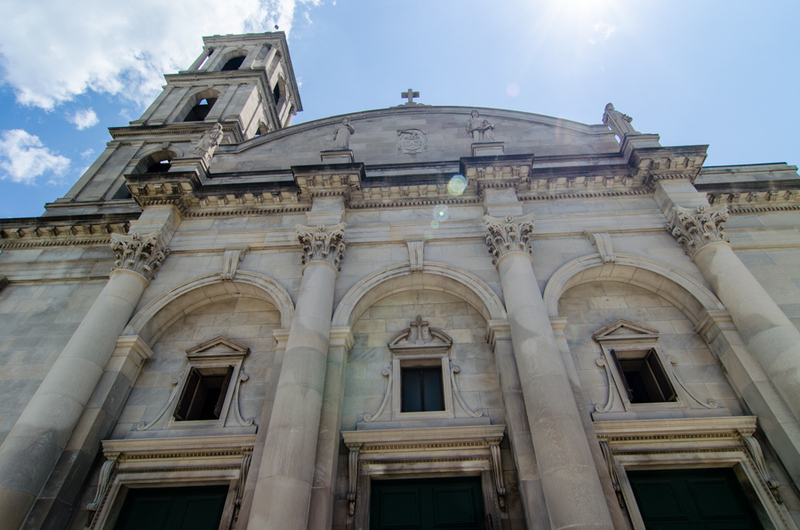 In 1990, another nearby parish, Holy Cross, was closed and merged into St. Clara – St. Cyril. In a nod to the membership of the new parish, the name was changed to St. Gelasius, after an early Pope of African descent. 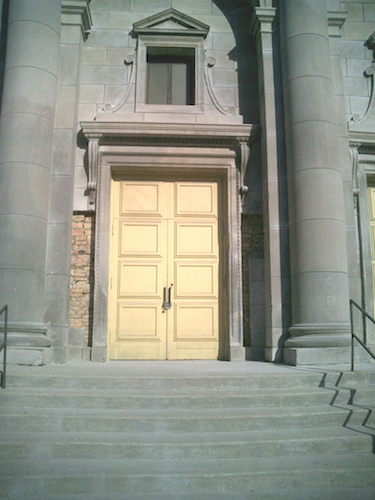 By June 2002, Mass attendance at St. Gelasius had fallen below 100, and the Archdiocese of Chicago decided to close the church. Vacant and deteriorating, it was soon scheduled for demolition. 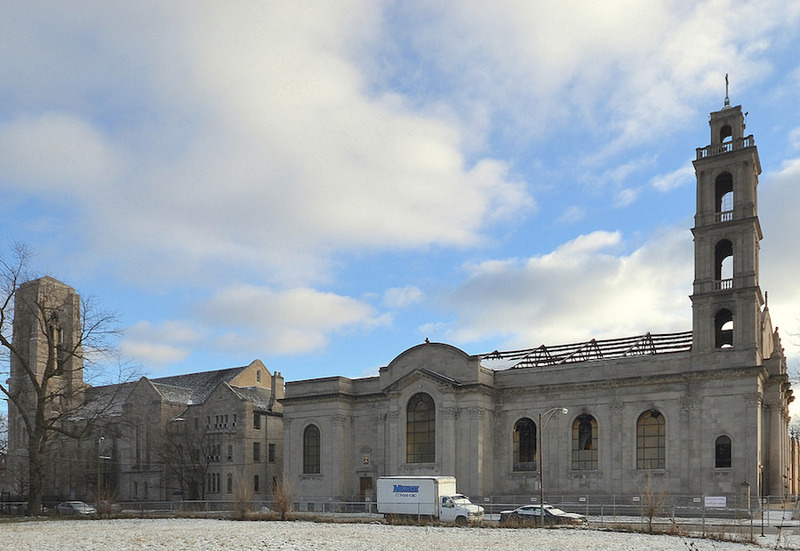 The Archdiocese expected to quietly demolish one of Woodlawn’s few remaining landmarks. Neighbors – including Sister Therese O’Sullivan (sister of the former pastor) – objected, and rallied the support of the wider community. This strong public support inspired city officials to develop a heroically novel new reading of their own ordinance: since the building was no longer in regular use as a church, it was no longer subject to the exception. The church was landmarked and protected in early 2004. 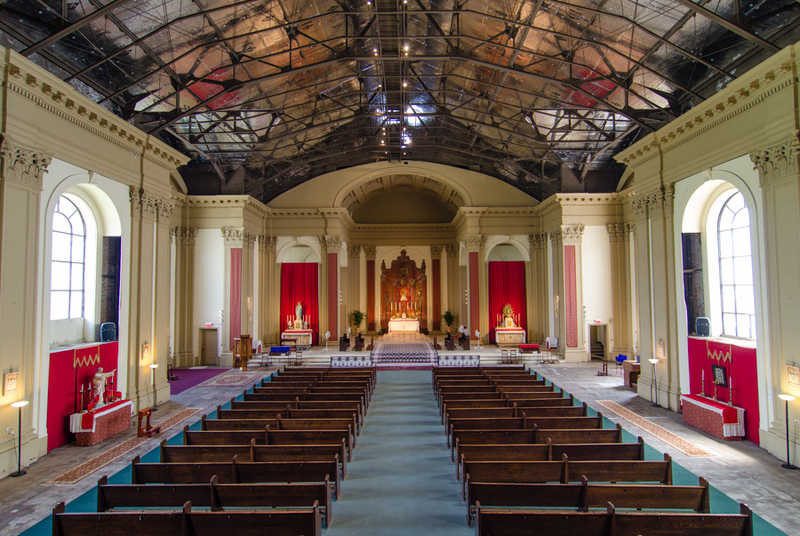 Fortunately, the Archdiocese was able to turn to the Institute of Christ the King, a religious society with a track record of restoring church buildings for use. The Institute located its national headquarters next door, dedicated the church as a Shrine, and set about the daunting task of restoration in 2006. The project made steady progress, with fundamentals like the roof taking top priority. Expected to cost over $7 million, the Institute planned to build a Baroque nave suited to the exterior appearance of the church. 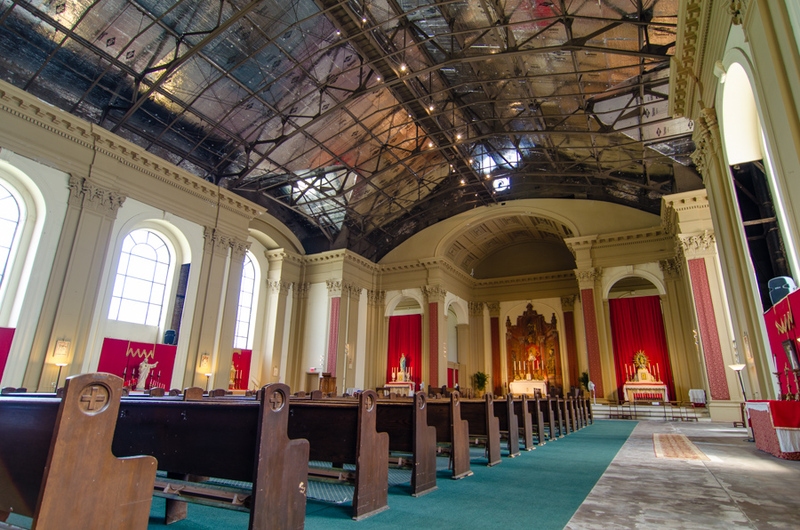 In the meantime, the growing congregation worshipped under a ceiling of exposed roof trusses, hosting community and cultural events that wove the Shrine into the life of the Woodlawn neighborhood. Unfortunately, shortly before Christmas, the Archdiocese decided, once again, to demolish the building. They found the structure to be hazardously compromised, and the cost of restoration prohibitive. 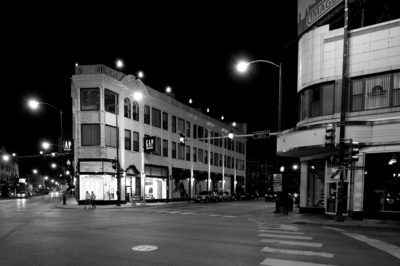 They asked for, and perfunctorily received, the permission of the Commission on Chicago Landmarks to demolish the building (a necessary first step towards demolition of a landmarked building). Despite a strong showing from the community at the Commission hearing, there seem to be no bureaucratic heroics on tap this time around. 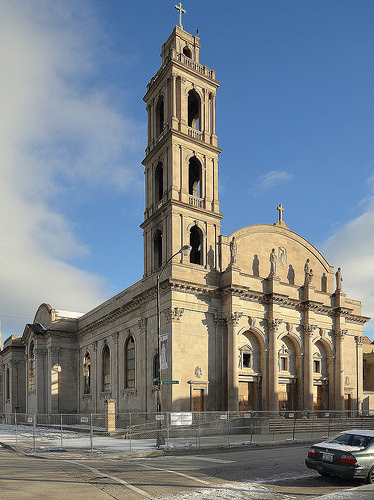 The Archdiocese has offered to explore two options with the Shrine: 1) they would be moved to a vacant church building in a different neighborhood, or 2) a new church would be built on the site of this structure. There were no further details or timeline offered with regards to this new construction. 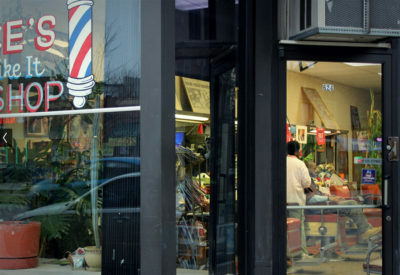 Organizations assisting the community, such as Preservation Chicago, have put forth a range of alternatives to demolition. The exterior walls might be stabilized, or even deconstructed and carefully attached to a new building on the site. 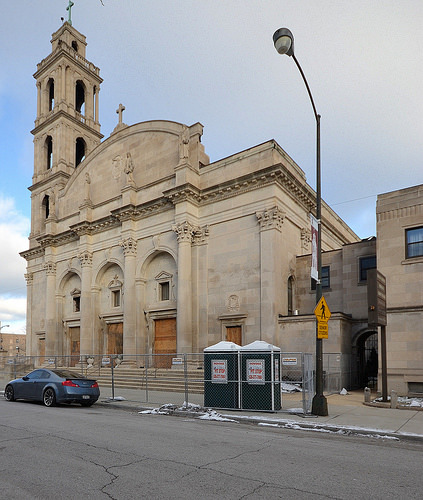 Something very similar was done with St. John of God in Back of the Yards, another Henry J. Schlacks church that was demolished, and whose stone façade found new life on a new church. A preservation-minded entity might purchase the property and stabilize it for some other future use. To date, the Archdiocese has not responded to these alternatives and instead continues to press ahead with plans to demolish. Neighborhood residents are calling on to the Archdiocese to allow time to explore these options. 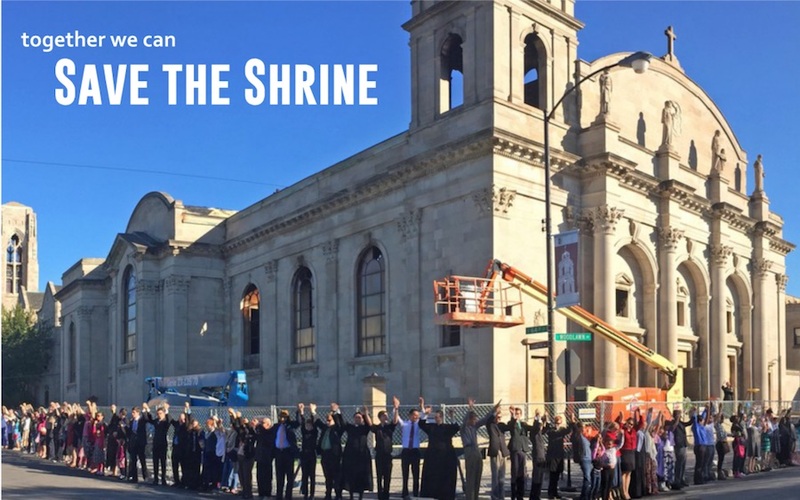 They feel that reuse of this structure is the most cost-efficient outcome, amenable to the Shrine, the Archdiocese, and the Woodlawn community. With your help, this significant piece of architecture, steeped in the complexities of Woodlawn’s history, might once more be saved, and continue to contribute to the resurgence of the neighborhood.